The news media is full of a whole lot of hate and discontent these days. It seems that they are fueling the anger and violence going around the country. The news media's constant barrage of cruel and bitter criticisms of President Trump on a daily basis, and their rabid like hunger for more unrest, seems to be unquenchable. The ongoing assault on our historical markers, our memorials and statues dedicated to people and events in our history, especially Confederate statues, seems to be persistently promoted by the news media. Their cameras and the promise of getting on the news is what attracts protesters with bad intentions. Yes, no different than sharks and blood in the water. In Charlottesville, Virginia, an assorted crowd gathered to protest the removal of statues of Confederate soldiers, Confederate memorials. One group was there to protest their removal. Another group was there to protest those protesting. Then the hate groups showed up. Most were not from Charlottesville. Many were from other states. It's true, we later found out that many if not most were brought there from out of the area. And yes, the counter protest hate group that showed up with clubs and dressed for war was said to have been paid $25 an hour. One hate group there was waving Fascist Socialist flags of those we defeated in Nazi Germany. The other carried Communist Socialist flags of the now defunct Communist state that the world knew as the Soviet Union. Both hate groups waved the flags of those we Americans defeated at one time or another. Of course their were good people there, yes there were. They did not associate with either hate group. They had a different agenda. Their concern was to keep the memorials in place because in many cases those memorials represented the history of their families, their town, their resilience, their history of defending the South against what was seen as invaders from the North. I can understand how people from there are upset that the monuments dedicated to their ancestors are now seen as vile when they are not. Some say that the monuments that they want pulled down represent oppression of Black Americans, that they represent those who fought to protect the institution of slavery. But what if they they are wrong and they don't? What if the memorials stand as tributes to soldiers who stopped pillage and destruction of their town? 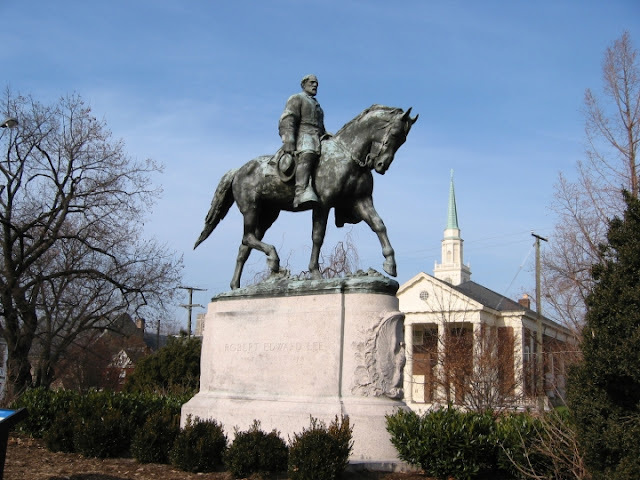 For me, I wanted to know why Charlottesville, Virginia, became the battleground over the removal of Confederate memorials throughout the South. Frankly, the only thing that I have ever read about Charlottesville was that Union General George Armstrong Custer once retreated from there after an hour long skirmish. Fact is, there were no big Civil War battles in Charlottesville and it wasn't very important to the North militarily, that is other than as a diversion which led to the skirmish that I mentioned. Fact is, it's said that the folks in Charlottesville provided some materials to the Confederacy but not much. The Charlottesville Manufacturing Company operated cotton and woolen mills that made Confederate uniforms. The factory produced uniforms designed especially for the county's home guard which was known as the Albemarle Light Horse Cavalry. Their jackets cost $2.75 and a pair of trousers cost $1.50 each. The factory was burned down by the occupying Union troops in 1865. It was rebuilt and reopened in 1867 as the Charlottesville Woolen Mills. It later became Albemarle County's largest industry for many years. A man by the name of Marcellus McKennie opened McKennie and Company on July 1st, 1861. He was in the business of manufacturing swords for the Confederacy. His firm put out four to five swords a week. No, that was not what anyone would call record breaking production by any stretch of the imagination. To give you an idea just how slow that was, about 30 miles away, manufacturer T. D. Driscoll in the town of of Howardsville was making 28 to 30 swords a week. And yes, that was during the same time period. Charlottesville did preform one very essential service to the Confederacy as it had a 500 bed hospital that was used by the military. Yes, both sides at one point or another. The Confederacy first and then the Union after they occupied that town. I'm guessing that they were glad that they didn't end up burning it to the ground as planned. As for that hospital, it actually employed hundreds of residents from Charlottesville. Yes, white and freed slaves. It's also said that it had anywhere between 15 to 50 doctors to treat its more than 22,000 patients. Here's another bit of trivia about Charlottesville. At that hospital, Dr. J. L. Cabell who was a professor of anatomy and surgery at the University of Virginia also managed the hospital. He oversaw, among others, Marcellus McKennie the sword maker who was also a surgeon and Dr. Orianna Moon. While Marcellus McKennie was a surgeon and sword manufacturer, he was also a Colonel in the 88th Virginia which were part of the town's defenders. As for Dr. Moon, she was the hospital's superintendent of nurses. She was an Albemarle County native who was described as being anti-Slavery. She was a graduate of the Female Medical College in Philadelphia, Pennsylvania, and she was one of only 38 women who held medical degrees in the entire United States that year. Most of the 1,100 patients who died at the hospital during the Civil War are buried in unmarked graves in a field adjacent to the University of Virginia cemetery. And yes, I'm sort of surprised that ANTIFA hasn't demanded that those graves-stones be removed just as they're demanding that other Confederate statues be removed. Charlottesville General Hospital cared for soldiers wounded in battle and those sick from disease. What a great number of people probably don't realize is that diarrhea, typhoid, measles, dysentery, and pneumonia were far more common ailments, then the 40% of the patients that were there being treated for gunshot wounds. And yes, amputation was the most commonly performed medical procedures when it came to gunshot wounds of limbs. As for those amputations, Charlottesville was known to provide many of the Southern states with artificial limbs. A firm named G. W. Wells and Brothers provided artificial limbs both during and after the war. In fact, that firm supplied Confederate General John Bell Hood with an artificial leg after he lost his right leg at the Battle of Chickamauga in 1863. An interesting bit of trivia is that General Hood was recovering in Richmond when he received his artificial limb from Charlottesville. Fact is he had already ordered one and it had been sent to him from France. It's said he preferred his Charlottesville limb over the French artificial leg. Friends, artificial limbs was a big deal since many many soldiers needed them during and after that war. If I recall, artificial limbs accounted for 20 to 30% of some state's budgets after the war. And fact is, that was for many of the states involved in the fighting. It's said that Charlottesville had a population of about 3,000 at the beginning of the Civil War. And though it only had 3,000 residents, it was the largest town in Albemarle County. Of course with the production of clothing and swords, there were a few factories there. And of course there were also banks and hotels. Amazing to me is the fact that the town had six newspapers at the time. As for Charlottesville, I found it interesting that the population of Charlottesville was made of mostly of Black Americans during the Civil War. In fact, before and after the Civil War, a period from 1820 to 1890, Blacks were the majority of the town and in Albemarle County as a whole. And while there were slaves there, the town of Charlottesville also had a number of freed slaves who lived there. For some, I'm sure that fact may be a little hard to believe since many folks are led to believe that all Blacks in the South were either slaves or on the run going North. But it's true, according to the United States Census of 1860, Albemarle County was home 13,916 Black slaves, 606 freed slaves, and 12,103 Whites. I couldn't find any statistics regarding how many White slaves were in that county at that time. But rest assured, Virginia did have White slaves. And most, well most were Irish. If you find that interesting, here's another bit of history that might amaze you. Charlottesville was partially integrated in that it had a bi-racial First Baptist Church there even before the Civil War ever started. In fact, it is said that many Black members of that congregation also went on to establish The Charlottesville African Church in 1863. Yes, imagine that for a moment. In the middle of the Civil War, in the South, in 1863, Blacks, both slaves and freed slaves, decided that they wanted their own church and simply started one. No, you don't find that sort of information in history classes. While some people today are angry at Confederate soldiers, they actually defended Charlottesville from being looted and razed to the ground. And while many today are angry at Confederate soldiers, fact is the most prominent citizens in that town were Democrat slaveholders. Charlottesville's wealthy civilians were the slaveholders, and they wanted to maintain the culture and racial divide of the antebellum South. Among some of the ways that they tried to maintain the statuesque was to require certain standards of behavior by everyone, including slaves and freed slaves. For example, the wealthy civilian slave-owners demanded that their slaves did not smoke in public. Those who did would get ten lashes. That was for Black and White slaves. For freed slaves, there was a $10 fine for violating such rules as not smoking in public. As for slaves or freed slaves violating the town's curfew of being out past nine o'clock at night without written permission, there were lashings and fines as well. People today probably don't know about how the law also cracked down on the mixing of the races back then. Yes, it went on back then. For example, there was a freed slave, a Black man by the name of Jackson. He lived on University of Virginia property. In 1863, he and his wife were evicted from the University grounds and told to stay away. Yes, all because he was married a White woman. Imagine that. Of course hypocrisy being limitless, when the Confederacy decided to draft Blacks for service in the Confederate Army and for labor to assist with the war effort, it's said that civilian slave-owners would hide or move their slaves rather than allow them to serve or work for the Confederacy. But even though that was the case, from 1862 to 1865, about 1,000 slaves, mostly Black but also some White slaves were pressed into service to fight for the Confederacy. That's the number of slaves that Charlottesville and the rest of Albemarle County had to offer. So now you're wondering, how about Civil War battles there? Well, Charlottesville pretty much avoided seeing fighting during the Civil War. On April 17th, 1861, when the Virginia Convention in Richmond voted to secede, as with others in the South, most Charlottesville residents were all for supporting a Confederacy. While most today think the Civil War was all about slavery, fact is it had more to do with unfair tariffs and economic pressures being imposed on the South by the Federal government in Washington, D.C.. The economic policies of the Federal government affected the agricultural base of the South in horrible ways while not affecting the industrial North. Southern states affected by the Federal government's unfair trade and economic policies had enough of what Washington D.C. was dishing out. I believe that the Southern states saw being part of the United States as being a part of a compact or an alliance. As with most of the other states at the time, Virginia saw itself as it's own nation allied with other nation states. They looked at their alliance with the other states that made up the United States as being voluntary. For a modern comparison, Virginia was no different than modern day Great Britain who just exited from it's alliance with the European Union. The Brits did so because the European Union capital in Brussels Belgium was imposing unfair rules and regulations on Great Britain. The British wanted their sovereignty back and withdrew from that compact agreement. In reality, Virginia believed that they had the right to do the very same thing back in 1861 for most of the same reasons. They felt that they volunteered to join the alliance. And frankly, I truly believe that they saw it as an alliance and not as a forfeiture of their own sovereignty. In 1861, after the vote for secession, the 19th Virginia Volunteer Infantry Regiment was raised in Virginia for service in the Confederate States Army. It fought mostly as a part of the Army of Northern Virginia. The 19th Virginia Infantry was organized at Manassas Junction in May of 1861, and it contained men recruited at Charlottesville and in the counties of Albemarle, Nelson, and Amherst. The 19th Virginia actually served with the Army of Northern Virginia all the way through to the Appomattox Campaign when General Lee surrendered in 1865. The 19th Virginia Infantry Regiment was commanded by U.S Army West Point graduate Philip St. George Cocke as its Colonel. Composed of ten companies, the 19th Virginia included two companies from Charlottesville. Those units were Company A of the Monticello Guard and Company B of the Albemarle Rifles. Charlottesville also put together an 11 man regimental band which was known previously as the Charlottesville Silver Cornet Band. That band played such great music that they were actually considered the best in the Army of Northern Virginia. Sadly, the band disbanded in 1862. So the tenure of the Charlottesville Regimental Band was actually pretty short. And no, I have no idea if they went back to calling themselves The Charlottesville Silver Cornet Band. The 19th Virginia is said to have fought at the First Battle of Manassas, also known to the Union as the First Battle of Bull Run. They served at the Battle of Williamsburg, the Seven Days' Battles, the Battle of Antietam, and were part of Pickett's Charge on the third day of the Battle of Gettysburg where lost 60 percent the regiment were either killed or wounded. Of those lost during the course of the Civil War, it is said that of the approximately 1,600 men who served in the 19th Virginia's ranks, only 30 were left to surrender at the Battles of Sailor's Creek on April 6, 1865. Yes, just three days before Confederate General Robert E. Lee surrendered to Union General Ulysses S. Grant. As you can see, though the men of Charlottesville and the rest of Albemarle County fought to stave off what they saw as a Northern invasion, the fighting was mostly to the East and West of Charlottesvile. That is other than the raid led by Union General George A. Custer. But frankly, the town's Confederate defenders stopped Custer just north of the town in the spring of 1864. Most Confederate Generals were no different than the vast majority of their troops in that they did not own slaves. Most Confederate soldiers in Virginia saw their duty as protecting their homeland from invading Northerners. As for Charlottesville's Confederate defenders, it was staffed by it's residents for the most part. They organized units including a provost guard, a home guard, and the 47th and the 88th Virginia militia regiments. In 1864, Charlottesville did become a diversionary target of a Union Army operation which later became known as the Kilpatrick-Dahlgren Raid. The raid took place when Union General Hugh Judson Kilpatrick launched a cavalry attack on Richmond itself in 1864. This was an operation meant to liberate 15,000 Union prisoners of war being held in Richmond. General Kilpatrick's plan required two diversionary attacks to distract Confederate defenders. Union Colonel Ulric Dahlgren, yes the one-legged veteran of Gettysburg, was to strike at Richmond from the south while Union General Custer was to hit Albemarle County. Custer's attack was meant to divert Confederate troops away from Generals Kilpatrick and Dahlgren. At Madison County, General Custer and his command of 1,500 troops set out to destroy the Lynchburg Railroad Bridge over the Rivanna River. They were then to attack and burn any factories and supplies, and even the hospital, in Charlottesville which was 40 miles away. On February 29th, 1864, General Custer crossed the Rivanna River near the Earlysville–Charlottesville road and launched his surprise attack. He attacked the camp of Confederate General J.E.B. Stuart's Horse Artillery Battalion which was made up of about 200 men. Many of them recently wounded and convalescing. Because of the overwhelming odds, General Custer captured the Confederate camp and burned everything there. The Confederate artillerymen briefly retreated to a nearby hill to regroup when one of their own caissons is said to have accidentally exploded. The Confederates defenders were said to be in the process of making a counterattack when that caisson blew up. So at that very moment, Union General Custer hears the explosive and thinks that Confederate artillery is opening up. So even though he has an overwhelming force, he retreats because he though that Confederate reinforcements had arrived. And friends, even though Custer's skirmish near Charlottesville only lasted less than an hour, local residents designated it the "Battle of Rio Hill." Custer did destroy the Confederate camp, but he failed at his primary mission of diverting Confederate troops from Richmond. To salvage some good news from what turned out to be quite a fiasco, Union General George G. Meade, who was the Commander of the Army of the Potomac, declared the Charlottesville expedition a success. By early 1865, fearing the onslaught, the looting, pillaging, the burning of the town, by Union troops, the town's fathers sought out the Union Army to sue for peace. Yes, because of their fears, town and university officials surrendered to Union Generals Philip H. Sheridan and General George Custer on March 3rd, 1865. It is said that the Union initially occupied Charlottesville following General Robert E. Lee's surrender a month later. The town soon came under the jurisdiction of the Union Army as an occupation force which consisted of a regiment of Pennsylvania cavalry. The city fathers surrendering Charlottesville was to prevent the town from being razed, which thankfully it wasn't. It should be noted, since we're talking about monuments and why they are there, that the residents of Charlottesville at the time were very thankful to their Condeferate defenders for saving their town. In fact, knowing that the Confederate defenders stopped the destruction of Charlottesville by Union forces, the women of Charlottesville, both white and freed slaves, presented a $500 silk flag to the Confederate General J.E.B. Stuart's Horse Artillery Battalion. That flag read, "From The Ladies of Charlottesville To Stuart's Horse Artillery, Our Brave Defenders." Southern towns like Charlottesville which survived the war have a debt of gratitude to the Confederate Army for saving their towns and cities. Complete and total destruction of towns and cities were common place during the Civil War. As for what those women did, it was a wonderful gesture. It was truly a wonderful gesture from the great ladies of Charlottesvilles who knew how to say thank you to those who saved their town from ruin. I find it interesting that the statue in Charlottesville that was the center of such violence and hatred not too many days ago, was one of Confederate General Robert E. Lee. I find it interesting that the statue was unveiled in 1924 by General Lee’s three-year-old great-granddaughter, that it was actually made in the North, and that it was designed by a New York sculptor. I also find it amazing that people would attack General Robert E. Lee who really was the great defender of Virginia. Friends, it is really a shame that there are too many today who have no clue why we Americans have memorials dedicated to those who we owe a debt of gratitude, to those who fought overwhelming odds to protect other Americans, to those who have been dead ages and ages ago and should still be remembered for their great deeds. Their efforts and deeds should not be forgotten. And by all means, their lives and purpose should not be re-written by those who with a political agenda. Those who now attempt to re-write history for their own self-interest. Their lives and accomplishes should not be lessened by those of far lesser character in this modern world. Tom This is what is missing in our society today...History. I would gamble to say that 99% of the "protesters" against probably never considered the history and the real meaning behind the monuments there and all over America! Thank you for your lesson. Exactly... Many people seem to "jump on the Band Wagon" without truly understanding the whole story. Great article Tom! very much appreciated!